James William Fryer was born in Eng. circa 1911. He came to Canada in 1932, married and came to Thamesford in 1938 where he and his wife helped run the store owned by Alf Robins. 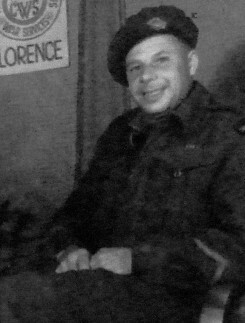 He joined the army in 1940 and engaged in coastal duties of the English Channel during the Battle of Britain, on to Sicily and the invasion of Italy and from there to France and Holland. He handled the gasoline for his battalion. His truck was on fire only once and that was from faulty brake lining. He felt himself fortunate as he saw as many as eight or nine trucks burning at one time. After discharge in 1945, he bought the store from Alf Robins.He and his wife had three children: Tommy, Elsie, and Nora.